San Francisco County – List of Stone Quarries, Stone Companies, Etc. San Francisco, San Francisco County, California (circa 1886) – Serpentine – Excerpt from Report of the United States National Museum Under the Direction of the Smithsonian Institutions For the Year Ending June 30, 1886, Chapter entitled, “The Collection of Building and Ornamental Stones in The U. S. National Museum: A Hand-book and Catalogue,” By George P. Merrill, Curator, Department Lithology and Physical Geology. 1895 - San Francisco, San Francisco County, California - Stone Concerns Represented in San Francisco circa 1895. San Francisco County Mineral Industry (circa 1919) – Excerpt from California Mineral Production for 1919, Bulletin No. 88, by Walter W. Bradley, California State Mining Bureau, 1920. San Francisco, San Francisco County, California (circa 1886) – Serpentine – Excerpt from Report of the United States National Museum Under the Direction of the Smithsonian Institutions For the Year Ending June 30, 1886, Chapter entitled, "The Collection of Building and Ornamental Stones in The U. S. National Museum: A Hand-book and Catalogue," By George P. Merrill, Curator, Department Lithology and Physical Geology," pp. 285-291. "California – Serpentine. – Inexhaustible quantities of serpentine of a deep green or yellowish color occur in the region round about San Francisco, and often in such situations as to be easily available, as at the head of Market street. So far as observed none of the material is of such a quality as to render it of value for ornamental work, while its gloomy color renders it equally objectionable for purposes of general…." San Francisco, San Francisco County, California (1895) - Stone Concerns Represented in San Francisco circa 1895. The following information is from The Monumental News, August, 1895, Vol. 7, No. 8, Chicago, Illinois, pp. 510. Jones Bros. & Co. of Boston; The Vermont Marble Company of Proctor, Vermont; W. S. Brown & Co.; Daniel Sheerin & Sons; Clarke & Lloyd; Metropolitan Marble Works, A. Paltenghi & Co., proprietors; F. A. Maestretti, proprietor of the Laurel Hill Marble Works; and W. H. McCormick, Geo. H. Jones, and H. O. Brower. "Surprising as it may appear at first glance, San Francisco County is listed among the mineral producing sections of the state, actual production consisting of crushed rock, sand and gravel. Small quantities of various valuable mineral substances are found here, including cinnabar, gypsum, lignite, and magnesite, none, however, in paying quantities. A Leschen & Sons Rope Co. of St. Louis, MO. 92 Centre St., New York, N.Y.
137 East Lake St., Chicago, Ill.
85 Fremont St., San Francisco, Cal. Leschen Co’s. Wire Rope Tramway at Cement Works, Ogelsby, Ills. 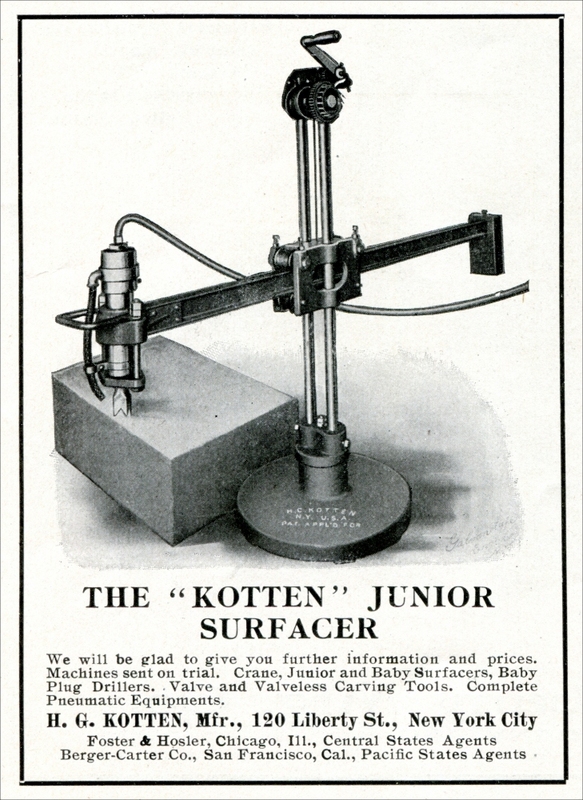 The “Kotten” Junior Surfacer embodies simplicity, durability, efficiency, economy. We also manufacture crane surfacers, plug drills, baby rock drillers, valve and valveless type carving tools. 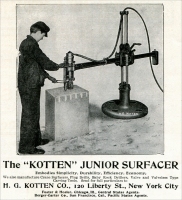 Berger-Carter Co., San Francisco, Cal., Pacific States Agents for H. G. Kotten Co., New York City, “Kotten” Junior Surfacer advertisement. "Blue Rock Quarry, at corner of Twenty-sixth and Douglass streets. The stone is a hard, blue-grained, metamorphic sandstone, with a flinty fracture. All machinery has been removed, and the quarry is idle. It was formerly worked by Gray Brothers." San Francisco, San Francisco County, California - Clarke & Lloyd (stone contractor). The following information is from The Monumental News, August, 1895, Vol. 7, No. 8, Chicago, Illinois, pp. 510. “The marble and granite industry has become quite an important feature of Pacific Coast business and besides the local firms, many of the large eastern concerns are represented by branch establishments carrying considerable stock. "County Jail Quarry, on Ocean avenue, between the jail and Ingleside Park. the rock is a hard, gray sandstone, and is used for macadam. It is worked intermittently by the prisoners." San Francisco, San Francisco County, California - Daniel Sheerin & Sons (monument dealer). The following information is from The Monumental News, August, 1895, Vol. 7, No. 8, Chicago, Illinois, pp. 510. (pp. 1387) Classifieds: Lime, Cement, Hair, Etc. Goat and Cattle Hair, Fire Brick, Tile and Clay, Brick Dust, Monterey White Sand. 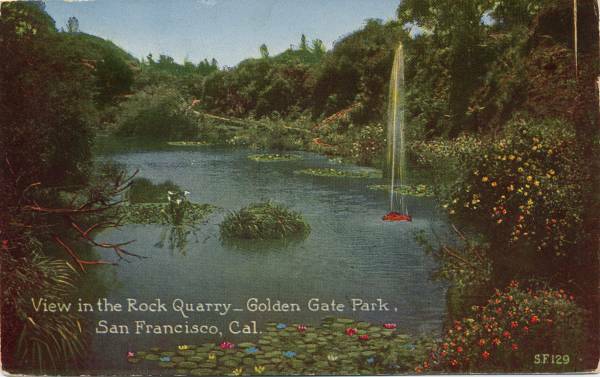 San Francisco, San Francisco County, California – Old Stone Quarry, Golden Gate Park, San Francisco, Cal. 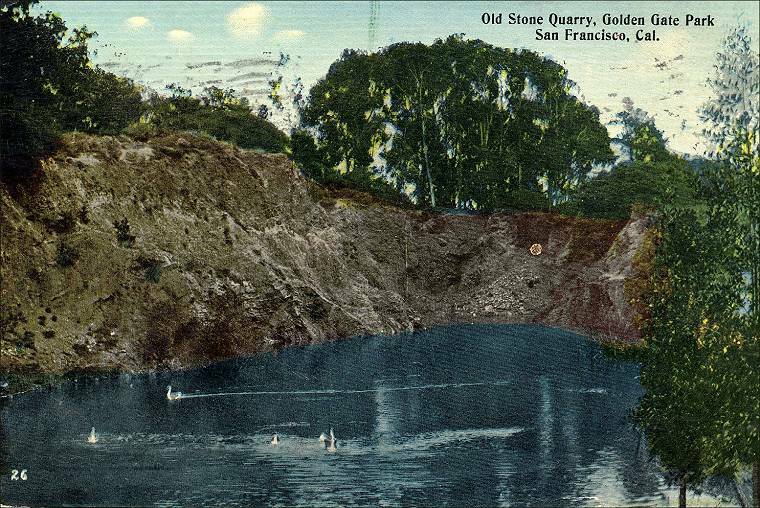 "Gray Brothers Quarry, at Thirtieth and Castro streets. Admission to quarry was refused." San Francisco, San Francisco County, California – the Inyo Marble Company – Operated dolomite quarries near Lone Pine and Keeler in the Owens Valley, Inyo County, California. 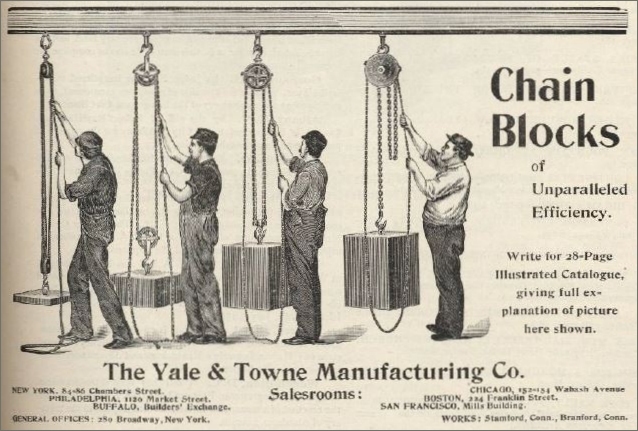 San Francisco, San Francisco County, California - Jones Bros. & Co. of Boston (branch of). The following information is from The Monumental News, August, 1895, Vol. 7, No. 8, Chicago, Illinois, pp. 510. L. J. Ruffino & Co.
"Lately Street Quarry. A small quarry face at the corner of Castro and Lately streets. The rock is a hard, siliceous red and yellow chert. Idle when visited." San Francisco, San Francisco County, California - Laurel Hill Marble Works. The following information is from The Monumental News, August, 1895, Vol. 7, No. 8, Chicago, Illinois, pp. 510. "Lewis & Biggio Quarry; R. Biggio and Mr. Lewis, of Colma, owners. On San Jose avenue, just north of Ocean View. The rock, a blue metamorphosed sandstone, is crushed by a jaw crusher at the quarry and is used for concrete purposes. The quarry is worked intermittently." 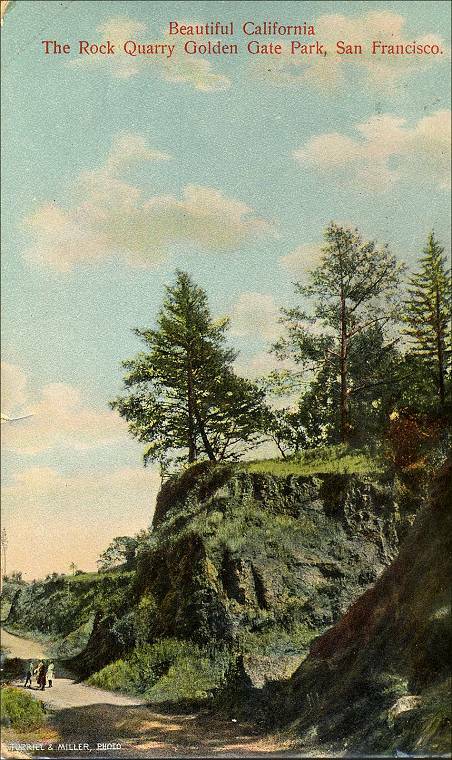 "Maloney Quarry. Mr. Ed. Maloney, Builders' Exchange, operates a small quarry on Twin Peaks, at the corner of Seventeenth and Ashbury streets. The rock is a red jasper, and is used for macadam purposes." San Francisco, San Francisco County, California – John D. McGilvray & the McGilvray Stone Company / the McGilvray-Raymond Granite Co.
San Francisco, San Francisco County, California – John D. McGilvray & the McGilvray Stone Company / the McGilvray-Raymond Granite Co. – “California’s Granites are Unsurpassed. John D. McGilvray, Pioneer Stone Man, Develops Great Industry Here” “Company Builds Mausoleums for our Cemeteries: Many of Finest Structures on Pacific Coast Erected by His Firm” (pdf), in the “Little Journeys to the Homes of Big Industries,” section of the San Francisco Chronicle, June 7, 1921, pp. 7. Raymond Granite Co. – The McGilvray Raymond Granite Co. – California Granite Co.
San Francisco, San Francisco County, California - Metropolitan Marble Works. The following information is from The Monumental News, August, 1895, Vol. 7, No. 8, Chicago, Illinois, pp. 510. "Ocean View Quarry, Ocean View, one block west of San Jose avenue. It is operated intermittently by the city for street repairing. The rock is a slaty shale, occurring in contorted beds." “Not until within the last three or four years was the business of quarrying, or manufacturing marble, engaged in to any extent in California, nearly everything required in this line having been previously imported already made. Much of the material is still (circa 1868) imported from abroad, the most of it from Italy, and worked here to order; though, for several years past, considerable quantities of this stone have been taken from the several quarries now open in this State. “The two principal works engaged in manufacturing marble are located in San Francisco, the value of their joint products amounting to about $200,000 yearly. The Pioneer Works, driven by steam, employ on an average thirty-five men - make tombstones, monuments, furniture, etc., and import most of their material. At the other yard, from twelve to fifteen hands are employed, and about the same style of articles are made. "Quimby & Harrelson Quarry; Quimby & Harrelson, 206 Kearny street, San Francisco, owners. On Amazon street, one block off the Mission road. The rock is a gray, metamorphosed sandstone. Quimby & Harrelson have not taken out any rock for some time, but the prisoners of the county jail have quarried some for macadam." "San Francisco Construction Company, 26 Montgomery street, operates a small quarry on Twin Peaks, on Carmel street. The rock is a red chert, is crushed in a small jaw crusher, and used for macadam." San Francisco, San Francisco County, California – Serpentine at head of Market Street (Serpentine) – Excerpt from Report of the United States National Museum Under the Direction of the Smithsonian Institutions For the Year Ending June 30, 1886, Chapter entitled, "The Collection of Building and Ornamental Stones in The U. S. National Museum: A Hand-book and Catalogue," By George P. Merrill, Curator, Department Lithology and Physical Geology," pp. 285-291. "California - Serpentine. – Inexhaustible quantities of serpentine of a deep green or yellowish color occur in the region round about San Francisco, and often in such situations as to be easily available, as at the head of Market street. So far as observed none of the material is of such a quality as to render it of value for ornamental work, while its gloomy color renders it equally objectionable for purposes of general…." "Simons-Fout Company, Box 153 Builders' Exchange, operates a quarry in connection with its brickyard on the Corbett road. Several faces have been opened in clearing the land for real estate purposes. Blue rock, red chert, and loose sand rock are quarried. The latter is used in making fills on the property, and the former is crushed for macadam, concrete, and rubble purposes. The crusher averages about 150 yards per day." "Telegraph Hill Quarry; Gray Brothers, 1122 Haywards Building, owners. At the corner of Green and Sansome streets. The rock is a highly metamorphosed blue sandstone, and stands with a nearly perpendicular face about 180 feet high. The quarry has been idle for about a year, but the crushing plant is being operated with stone brought in carts from their smaller quarry, of similar rock, at the corner of Chestnut and Montgomery streets. The face of this smaller quarry is nearly 100 feet high. "For three quarters of a mile around the foot of Telegraph Hill rock has been quarried for many years, first to fill in the bay, and at present for seawall and other concrete construction about San Francisco." "Twin Peaks Quarries. There are numerous small quarries on the slopes of Twin Peaks, which are worked intermittently, as rock is needed in small quantities." San Francisco, San Francisco County, California - the Vermont Marble Company of Proctor, Vermont (branch of). The following information is from The Monumental News, August, 1895, Vol. 7, No. 8, Chicago, Illinois, pp. 510. "Vulcan Quarry, at the base of Telegraph Hill, on Francisco street, between Kearny and Dupont, in the rear of the Vulcan Iron Works. George P. Wetmore & Co. quarry the rock and haul it in carts to their crushing plant on Lombard street, near Sansome. The stone is the typical blue rock, a metamorphosed sandstone, and is extensively fractured by numerous slips. It is used for rubble, macadam, and concrete purposes." San Francisco, San Francisco County, California - W. S. Brown & Co. (branch of). The following information is from The Monumental News, August, 1895, Vol. 7, No. 8, Chicago, Illinois, pp. 510. "George P. Wetmore Quarry. This large quarry is at the corner of Lombard and Montgomery streets. The office is at this quarry. C. A. Wetmore is superintendent. They quarry a blue and gray metamorphosed sandstone, and some altered slaty rock occurs in the slips. The face is about 100 feet high. No blasting is done. The rock is barred down, and large slips often cover the quarry floor with much broken rock. This is sledged and loaded into small skips, which are taken to the crusher by means of an aerial tramway. Rubble, macadam, and concrete rock are produced. A No. 5 Gates crusher averages about 150 yards a day. 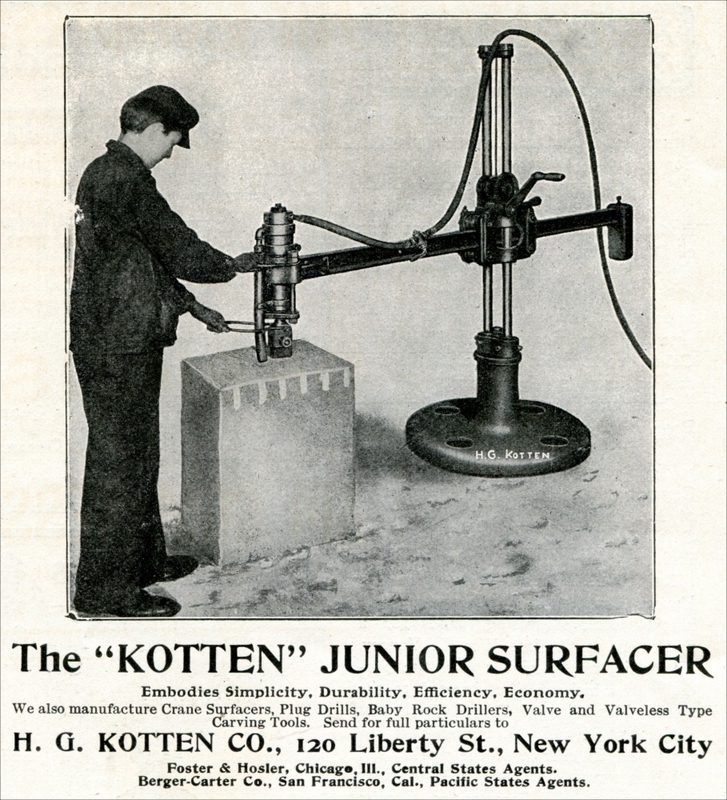 "This firm also operates a small crushing plant at Tenth and Division streets, by using the waste rock from the stone yards of the Colusa Sandstone Company and the McGilvray Sandstone Company." Write for 28-Page Illustrated Catalogue, giving full explanation of picture here shown. General Offices: 289 Broadway, New York – Works: Stamford, Conn., Branford, Conn.